Need a gift for Mother’s Day? Looking for something nice for your Mom’s birthday? Maybe it’s a holiday gift. Do you want DIY gift ideas for Mom? 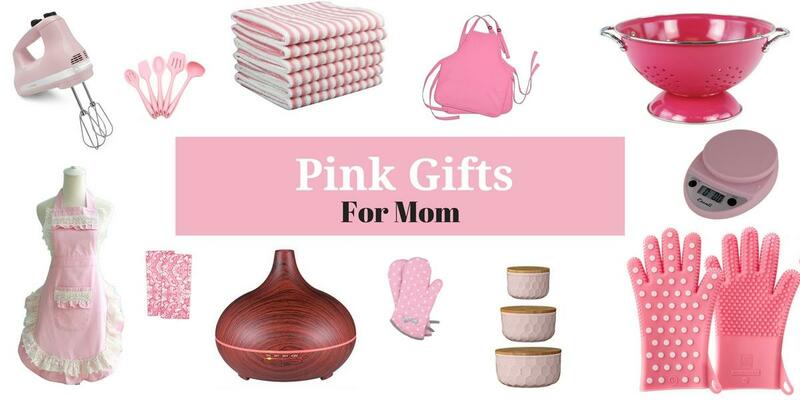 Here are some gorgeous pink gifts for mom. A lot of the items come in other colors too. And they’re all available online. So, if you’re short on time, grab one of these gifts online and get it delivered. And…if you’re good at DIY, I’ve got some great ideas for you. Many of these gifts can be used to make a gift basket or even a dish towel cake (please see below if you don’t know what I’m talking about). There are lots of ideas so get creative and start designing your DIY gifts for Mom. These gorgeous dish towels are multi-purpose. They can be used as a dish towel, tea towel or as an ordinary hand towel in the kitchen. Great gifts for mom when you think she has everything. They’re fast drying and come in a 6 pack. 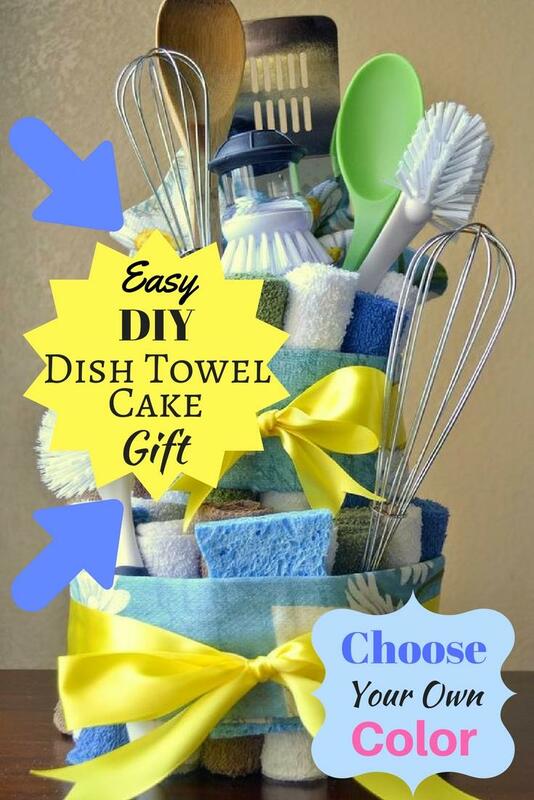 This makes them ideal for making a dish towel gift cake (see below) or a DIY gift basket. Each pink and white towel is 15 x 19 inches. Very handy for anyone’s kitchen. (For price, see below). Silicone trivets are so useful in the kitchen. And they brighten up the room with color. These are great gifts fro mom because silicone trivets can also be used as pot holders. I always use one to help open the lid on glass jars, it saves my hands and works every time. I’m also a big fan of silicone trivets for using under my mixing bowl. Every time I whip up a batch of muffins I like to stir it by hand. So I pop a silicone trivet under the mixing bowl and it stays put on the counter. You can never have enough silicone trivets in the house – I know I always misplace mine by leaving them in the fridge when I’ve used them under a warm Pyrex container of left-overs. (For price, see below). These beautiful pink blush colored bowls are good gifts for mom and would be a lovely gift for anyone. They look great sitting on your kitchen counter and they’re so useful too. A very thoughtful gift. (For the price, please see below). This cute apron is perfect for your mom if she loves to cook. It’s pretty and practical. I believe an apron is an ideal gift for any mother. Aprons have saved my clothes so many times. I’ve avoided turmeric stains, chocolate stains, tomato sauce stains and so many other combinations of tasty food stains by using an apron. I know this one looks gorgeous and you probably don’t want to get food on it but it’s better than the alternative and that’s getting a stain on your favorite top or the dress you’re wearing when you’re expecting guests to arrive. Aprons really do serve a purpose. They’re a great gift for mom. A plastic cutting board is great for cutting things up quickly. It is light weight and good for when you don’t want to get a big heavy wooden chopping board out. I use mine for grabbing quickly to cut up a few things. And in that color, it’s a pleasure to use. If you’re still looking for gifts for mom, a couple of these cutting boards in combination with a set of pink utensils, wrapped together, is a perfect present. This pink cutting board is sure to brighten up your kitchen. These tongs are fun and an instant conversation starter. They are small tongs, only 4.8 inches long. You can use them for serving appetizers or picking up small food items. A very handy gift for mom. The cute paws are a hit with children too. Oven mitts are essential but often boring. 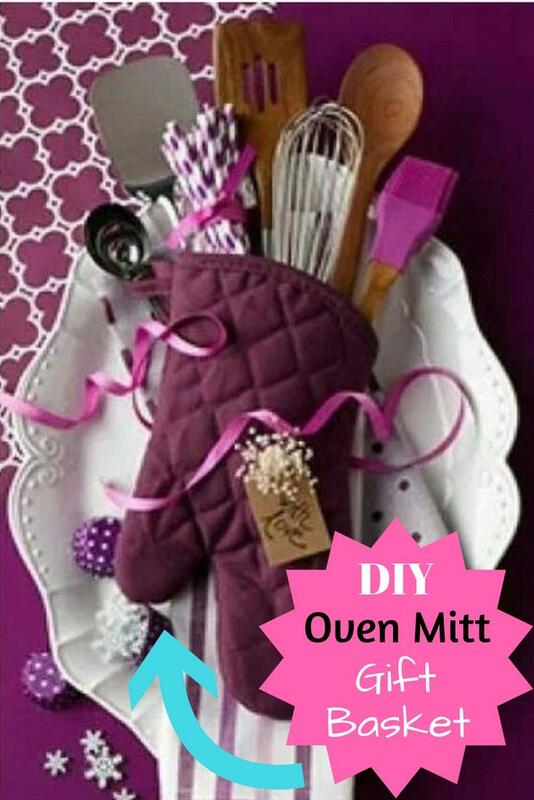 Surprise mom with this cute polka dotted pink oven mitt. If you want to make your own gift creation, try putting some pink spatulas and a rolled up pink silicone baking mat in the oven mitt so they stick out the top in an attractive way. These types of gift baskets always make good gifts for mom. You could even place the whole gift creation on a baking tray. 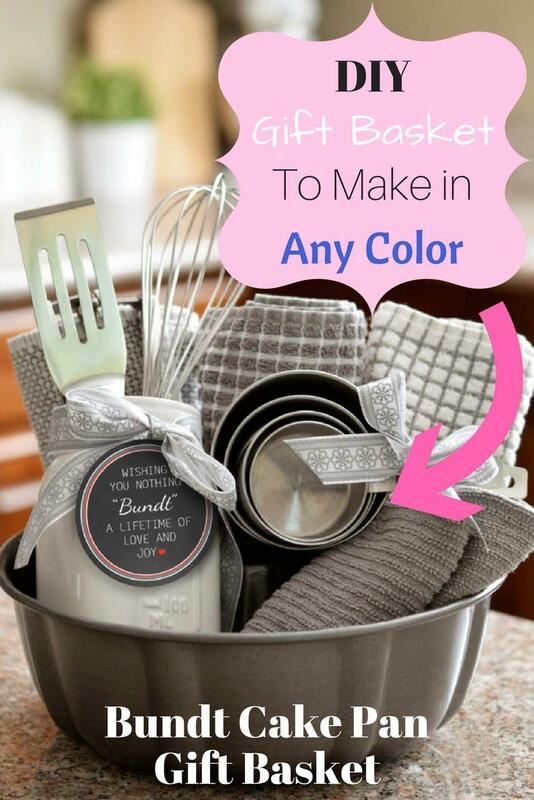 This way, you make a beautiful DIY gift basket with an oven mitt (see the picture below, you’ll need to scroll down). Some people pay $400 for a pink mixer. This one is only a fraction of that price. For less than $60 your mom can whip up a quick batch of cupcakes with ease. And this mixer looks great sitting on the counter. If you’re still looking for gifts for mom, try pairing a pink mixer with the pink dish towels for an attractive gift. Before I continue… I want to show you a great idea for a dish towel cake. It’s a DIY gift idea I think you’ll like. And you could use these pink gift ideas to make it color coordinated. Personally, I’m not a big fan of yellow, although I admit it looks good here with the blue. However, you could make a beautiful gift in pink colors. I suggest using one of the colanders at the bottom and place everything into it. Learn how to make this gift, step-by-step here. Put these pink utensils in a mason jar sitting on the counter and they bring a pop of color to your kitchen. So easy. I love using matching colors in my kitchen. It adds to the enjoyment of cooking. And all my friends comment on how good my kitchen looks. This kitchen scale is easy to use and runs on 2 AA batteries. It weighs up to 11 pounds (5kg). It also has an automatic shut-off feature after 4 minutes of no use which can be hard to find on some scales. The pink color is perfect if you want it match it to other pink items in your kitchen. It comes in other fun colors too. This gorgeous looking pink colander holds 3 Quart. It is powder coated enameled and looks great. Personally, I use my colanders for everything – draining pasta, washing salad, rinsing beans. I often leave a colander out on the counter because I use it so often. It’s nice to have a pretty one to use. This beautiful set of 2 pink dish towels will look good in anyone’s kitchen. If you’re keen to see more, there are matching oven mitts and an apron to complete the set. There are other colors available too. Personally, I think the pink is the best but I do like the black and white fabric also. This is a cute gift basket idea. It’s a perfect gift for your mom if she likes to bake. If you choose her favorite color and coordinate all the items together in the same color she’ll love it. We all have dish towels and spatulas in our kitchen, but your mom will love to receive new ones in her favorite color. I know I would be happy to receive such a thoughtful gift. See this gift basket here. This apron has 3 handy pockets at the front. They are deep pockets and good for holding items like a cell phone. This apron is a shorter length. Perfect for anyone who is a little bit shorter themselves. If you are tall, this apron will not fit. The apron is, of course, good in the kitchen but it’s also handy for crafts or similar hobbies. This lovely pink hand mixer has a soft start feature. It will bring the beaters up to speed more gradually so the ingredients won’t spatter everywhere. This KitchenAid hand mixer is quieter than a lot of others. It’s powerful enough to whip cream, beat eggs, cream butter and all the other cooking jobs you need it to handle. And it looks good. There’s a good choice of colors available if you’re looking for something other than pink. Treat mom to her own spa retreat at home. This essential oil diffuser is large enough to operate for up to 8 hours without refilling. It holds 300ml. The diffuser will automatically switch off when it runs out of water as a safety feature. The lights include 7 soothing colors and you can choose between bight or dim. The lights can cycle through the range of colors or you can choose your favorite and keep it on that one. Use the diffuser with oils or without as a humidifier to add moisture back into the air. Perfect to avoid dry skin if you live or work in air conditioning. The silicone surface on these whisks mean they won’t scratch your non-stick surfaces. They’re also easy to clean because food doesn’t stick to them. The three different sizes are really handy. I always like to use a smaller whisk to mix salad dressing in a bowl. They look great sitting in a jar on the counter and you can match them with a spatula set in pink to really make your kitchen look attractive. What a great DIY gift idea for mom or for anyone who likes to cook. In this example the oven mitt is placed on a beautiful plate. You could also put it on a baking pan as part of the gift. And on top of the baking pan you could spread out one of the silicone baking sheets to add color to the gift. Choose a color and customize your oven mitt gift basket any way you like. You could even include the pink kitchen scale or a rolled up apron. There are so many choices. Source. Silicone is such a versatile substance. You can use these as baking mats for pastry or fondant. They’re great for protecting your counter. The mats can be used under plates to catch spills from toddlers. They’re BPA-free and heat resistant. If you’re still looking for gifts for mom, these are an easy decision. I loving using a silicone mat under my mixing bowl because it is nonslip. These silicone mats and also handy on granite counters if you’re unpacking or washing delicate items like champagne glasses. You can place them directly on the mat knowing there is less chance of them smashing on the granite. These silicone mats are ideal for food prep and serving food. With so many uses, it’s an easy decision to get them as a gift for mom. Because they roll up you can easily place them in a gift basket you’re making for mother’s day or mom’s birthday. This pink colander has a 5 quart capacity. It is more upright in shape than many which makes it deeper. The colander drains very quickly with lots of holes in it. It also drains fully so there is no liquid left in the bottom. The shape has the advantage that it fits easily in most kitchen sinks. The feet are rubberized on the bottom so it won’t slide around even when placed on a wet surface. This is a high quality plastic colander and one that is very pleasing to use. It will suit you and your kitchen. And the handles are designed to hang it up when you’re not using it. These silicone oven mitt gloves come in two sizes with an easy measuring guide to choose the correct size. Each sale of these gloves contributes a donation to The National Breast Cancer Foundation. So if you’re looking for gifts for mom with the added bonus of a charity donation towards a good cause, look no further. The silicone gloves are good for lifting dishes out of the oven. They grip the dish better than a pot holder because you can get your fingers right around it. They look cute in pink with polka dots and they are delivered in a box, making them perfect as a gift for mom. Follow my Gifts for Mom Unique Board Here on Pinterest. This entry was posted in Gifts on April 6, 2017 by Edwina.